Element 4.1: Demonstrate effective verbal and non-verbal communication skills across a variety of instructional formats. 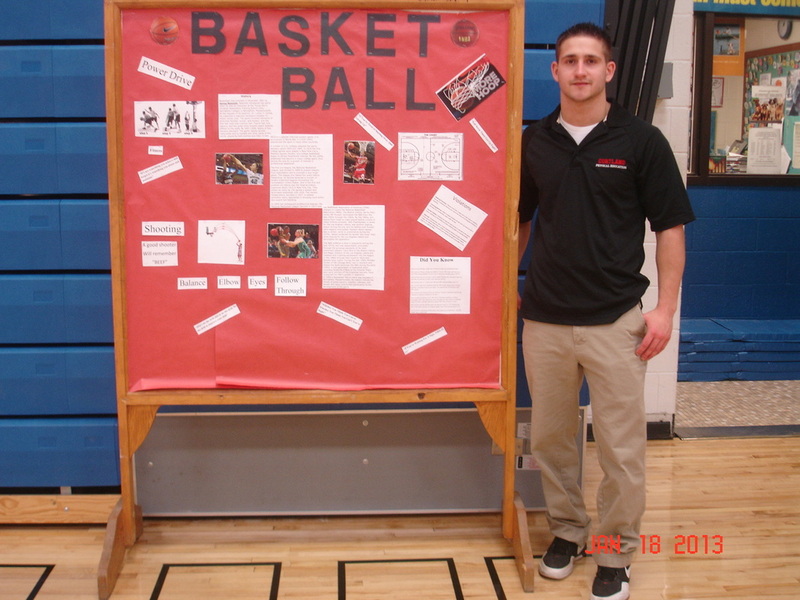 Reflection: This bulletin was used to instruct students on the history, rules, and skills of the game of basketball. I also designed fitness inspiration quotes to surround the board to help motivate students to reach their fullest potential. There are pictures of popular basketball stars known as Michael Jordan and Britney Grinder. I picked these two players because they were two perfect role models for the students to look up to. A visual aid can be a source of external inspiration for students to look at to help motivate themselves to do their very best. 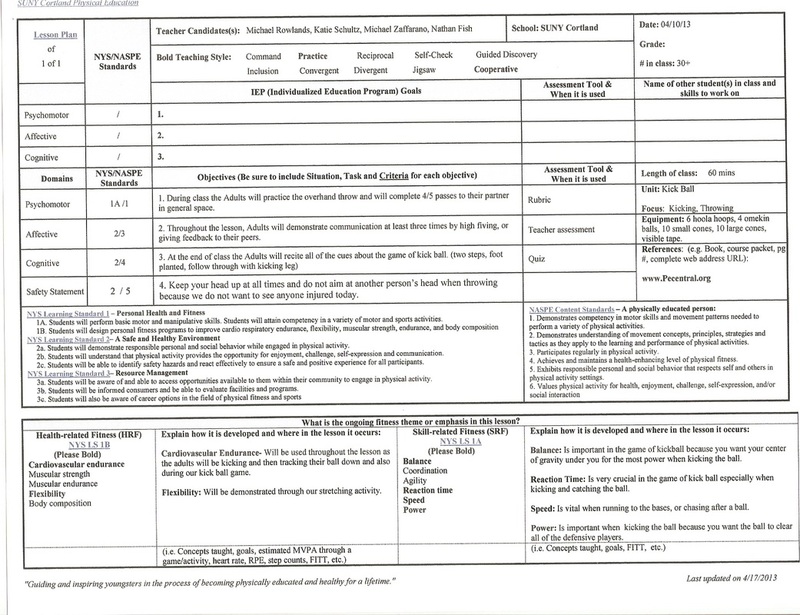 Element 4.2: Implement effective demonstrations, explanations, and instructional cues and prompts to link physical activity concepts to appropriate learning experiences. 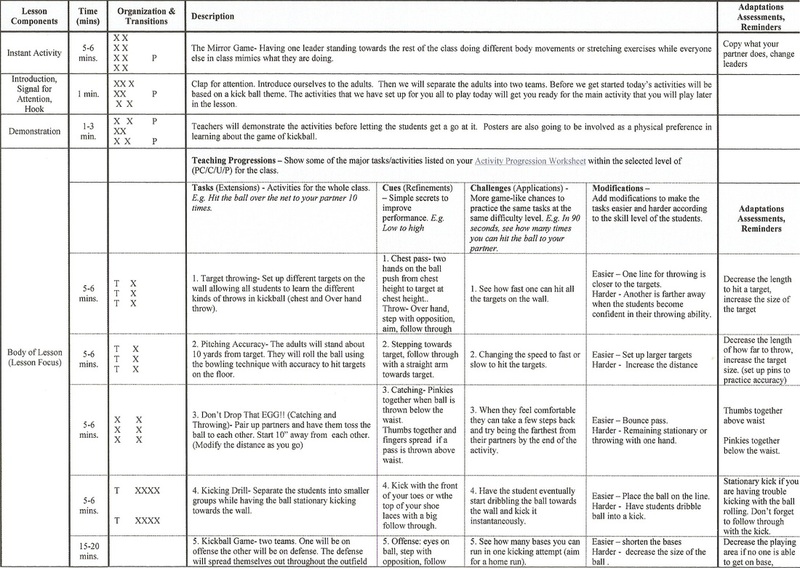 Reflection: This lesson plan was used to help the adapted adults improve their accuracy on pitching, kicking, and throwing in the game of kick ball. As you will see through our activities we have several stations leading these activities and giving the adults the proper amount of time to practice these skills. Kick ball itself lacks physical fitness in a way but in this case it helped unite the adapted adults and increased their team work and leadership skills. During this lesson we handed out a piece of paper to all of the adults that had 8 fitness stations implementing various fitness activities. We started the class with these stations because we new of the lack of physical fitness the game of kick ball would have. In order to work toward the adults 10,000 steps for the day, no better way than to give them a list of fitness activities to do as a warm up.